Sign the petition to demand that Hydro-Québec terminate its agreement to cooperate on cyber security with Israel Electric Corporation concluded on May 22, 2017. This memorandum of understanding is in fact a contract between two states: Quebec and Israel. 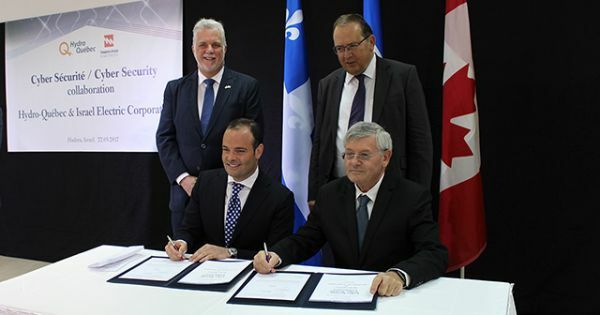 The cooperation agreement was signed as part of the May 2017 economic mission to Israel and the West Bank by Quebec Premier Philippe Couillard, in his presence. Hydro-Québec refuses to disclose the content of its partnership agreement with IEC in contravention of the Act respecting access to documents held by public bodies and the protection of personal information to which it is subject. IEC is working closely with the National Cyber Security Authority on military cyber defenses (IDF), intelligence services (Mossad) and the Water Authority. IEC’s security IS Mossad. A “partnership” in cyber security with Israel means “a pact with the Mossad and a pact with Israel’s apartheid regime”. IEC regularly cuts electricity in Gaza. IEC frequently cuts electricity in the West Bank. IEC electrifies the separation wall between Israel and Palestine. IEC has supplied electricity to illegal settlements in the Palestinian territories occupied since 1967. IEC supplies the Israeli army with electricity. Since 1948, Israel has repeatedly violated with impunity resolutions adopted by the United Nations and the United Nations Security Council and continues to ignore the International Court of Justice’s condemnation of its policies. Bullets and targeting were aimed to kill and maim as hollow bullets exploded on penetrating bodies: 112 killed, 13, 500 wounded (1029 women), 7,618 by gunshots, with 32 amputations and more coming. In signing its memorandum of understanding with Israel Electric Corporation, Hydro-Quebec – and the Quebec state – makes themselves complicit in these crimes. Please sign the petition demanding that Hydro-Quebec cancel its partnership with Israel Electric Corporation! To learn more about the cooperation of Canada’s energy industry read this IT World Canada article that provides details about Toronto Hydro, IESO (Ontario’s Independent Electricity System Operator), and the Canadian Electric Association, as well as Canadian energy sector. Israel enjoys a close relationship with Canada’s electricity sector. Last year, a delegation of Canadian electricity companies, government officials, and regulators visited Israel. Yesterday, Israel in Canada‘s Ambassador Rafael Barak, Nissan Amdur (Israel’s Economic Attache to Canada), and Yosi Shneck (Senior Vice President and CIO of the חברת החשמל לישראל Israel Electric Corporation), participated in IESO – The Electricity Outlet‘s Executive Briefing on Cybersecurity in Toronto. This entry was posted in BDS Coalition Actions, Campaigns, News, Take Action, Uncategorized and tagged BDS Quebec, Canadian Electric Association, Canadian energy sector, Hydro-Quebec, IEC, IESO, Israel Electric, Israel Electric Compnay, IT World, Ontario Energy Board, Ontario's Independent Electric System Operator, Quebec Premier Philippe Couillard, Toronto Hydro on July 15, 2018 by cbcjpi.